GREENVILLE, Texas — After video captured a deadly shootout between bounty hunters and a fugitive at a Greenville car dealership, law enforcement experts are weighing in on the incident. In 26 seconds of video captured on cell phone, you can see the moment bounty hunters Fidel Garcia and Gabriel Bernal approached suspect Ramon Hutchinson. They had been hired by a bail enforcement agency to return Hutchinson to Minnesota to face felony charges. As the video shows, the plan quickly fell apart. You can see as the suspect fumbles with his gun as the bounty hunters approach. 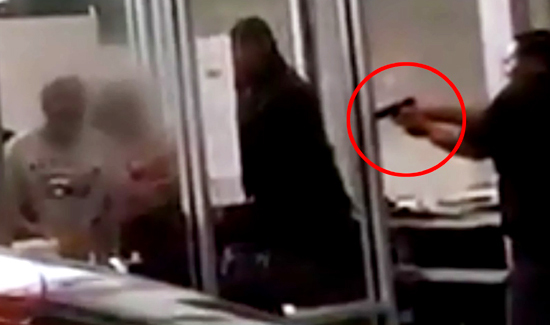 The gun goes flying in the air, and then the suspect struggles to regain control before about 20 shots were fired in a busy car dealership lobby. All three men died. “This is pretty startling, this shooting taking place in a public arena like this,” said John Matthews, executive director of the Community Safety Institute and a respected law enforcement expert. Matthews said that typically law enforcement might use four tactical officers to make this type of arrest, and he said a car dealership was not an appropriate location. He counted at least six bystanders in the footage as the shots rang out. Catherine Torrez, a private investigator and former police chief, served with bounty hunter Fidel Garcia on the board of the Texas Association of Licensed Investigators. “When [Garcia] saw the [suspect’s] gun, his partner drew down, and he did the right thing. I would have done exactly the same thing,” she said after watching the shooting on tape. Torrez said Garcia was responsible and well-respected in his field. She did not know specifics of why Garcia and his colleague would chose a car dealership for an arrest, but she said bounty hunters often use public places in an effort to minimize risk.